They say that variety is the spice of life. It's nice to have options, particularly in your gaming. Just a few changes here and there can turn an old favorite into a new favorite. 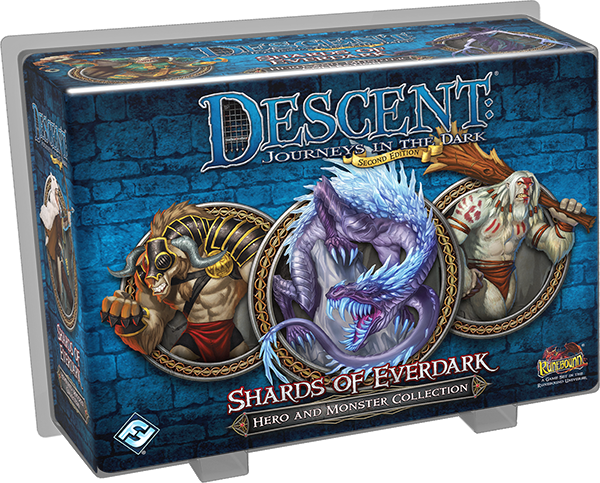 Well, Fantasy Flight Games is big on helping with just that sort of thing, and they've got a new Hero and Monster Collection coming for Descent: Journeys in the Dark they'd like to tell you about. This new set, called Shards of Everdark, comes with thirteen new miniatures, including four heroes, and three types of monsters. Like some other expansions, the heroes are new versions that were originally found in classic Descent. So if you'd like to get an updated version, or maybe you missed out on them originally, now's your chance. The monsters include two ice wyrms, two dark minotaurs, and five shades (the future must be very bright, indeed...). Expect to see this new set hitting shelves in the 2nd quarter of this year.